Park West Gallery founder and CEO Albert Scaglione provided his insights and history in creating his art gallery in volume 22 of Raine magazine. 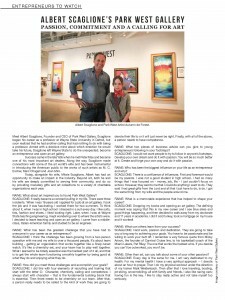 Dubbed “the art edition,” the magazine has a one-on-one with Scaglione, who speaks about his transformation from a mechanical engineer to the founder of an art gallery. The interview is featured in the “entrepreneurs to watch” section. Also featured in the magazine is Park West artist Romero Britto. For more recent media coverage featuring Park West Gallery, check out this article in Forbes about how artwork improves the workplace. Founded in 1969, Park West Gallery brings the experience of collecting fine art to more than 1.8 million customers around the globethrough art auctions on cruise ships, in major metropolitan areas and through gallery locations in Michigan and Florida.